My love of fragrance did not begin by smelling the contents of fancy bottles. I learned to love perfume in the garden. If you've read my reviews for any length of time, you may have noticed I often use botanical illustrations to "decorate" my posts; that's because any perfume that gives me a realistic representation of a beloved natural scent has captured my attention and has a chance at capturing my heart, too. I grew up in the countryside, and big parts of my childhood were spent outdoors: in flower beds, vegetable gardens, orchards, woods. The bounty of those places found their way into the kitchen, where another facet of my scent education took place (all those fruits, vegetables, spices, vanilla, chocolate, liquor!) To list my favorite fragrance notes would be a laughable exercise; I've been smelling everything that crossed my path my entire life...the list would be extensive. Still, the scent of stone fruits would be high on my list; I love the aromas of ripe apricots, plums and, especially, peaches. I can't believe my luck: Guerlain Vague Souvenir (released in 1912) has found its way to me twice. When I first started writing for Now Smell This (almost eight years ago! ), an anonymous reader who never gave me his-her name, sent me a batch of long-discontinued perfumes — most of which I had never heard of before. In that shipment: Vague Souvenir. Recently, when I bought a vintage fragrance online, a tiny bottle of Vague Souvenir Extrait was included (gratis) in the package; the bottle had a brittle/flaking label and its tassel turned to dust when I touched it. It's too bad Guerlain does not maintain an online database, full of gorgeous images, documenting all its creations. I've found little information on Vague Souvenir. What seem the most reliable sources list two fragrance notes all the time: plum and peach; other than those notes, jasmine and gardenia are sometimes mentioned. One of my favorite peach-scented perfumes is Guerlain Mitsouko. 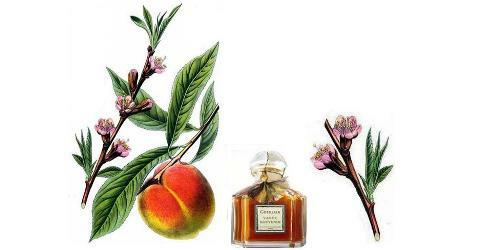 I was anxious to see how Guerlain presented peach in Vague Souvenir...seven years before iconic Mitsouko made its debut. Vague Souvenir was not a commercial hit (even though it survived into the 1950s); its jarring bits (almost-abrasive pollen, a menthol-y moment, peach aldehydes) may have prevented widespread adoration. Vague Souvenir brings to mind a strange perfume-gene-splicing of L'Heure Bleue and Mitsouko...but lighter/brighter than either. Both my Vague Souvenir samples are incredibly fresh for their age; they are both at least 55 years old. I wish you all could smell this lovely perfume "memory." NOte: top peach blossoms and fruit images [altered] via Wikimedia commons. Wow, an intriguing post, Kevin. Lost and Found fragrances…thanks for the description. Peach, old peach is very attractive. New peaches all seem too sweet to me. Meredifay…you’re welcome…I love ‘vintage’ peach, too. I’d never heard of Vague Souvenir. It sounds really interesting. Your description of the “jarring bits” makes me wonder if it wouldn’t fit in better as a niche offering today. What a wonderful review of a lost fragrance. I am so jealous – would love to smell it! I luuurrrve peach in perfume (i.e. Mitsouko, Nahema). Thanks for reviewing (but not for creating a lemming!). Rappleyea…sorry…it is terrible of me, I agree. Bravo, Kevin, and brava, Angela, for your posts on vintage and historic perfumes. I am obsessed with collecting samples of old Guerlains and I’ve never even HEARD of this one. Now I’m freaking out. I mean I’m ready to spend crazy money on just a 1/4 ml of Kriss because I need to smell ALL THE GUERLAINS. I wish one of the sample companies had this on offer. AH! New lemming. You lucky dog! It sounds fantastic. I must count my lucky stars also, I own a bottle of vintage Apres l’Ondee Parfum that I stumbled upon at a thrift shop & got for like $75. Pretty friggin amazing. Mike: I’ve had great luck the last year with finding AUTHENTIC and great smelling vintage perfumes. May the luck continue for us. MM: maybe we all should delete our lemmings lists and live happier? HA! I’m in love with the plums in Rochas Femme. Can barely wait the huge bottle I gote for almost nothing at Fragrancenet to arrive. And like everyone here, I’d love to try this! It would please my heart if the guys at Guerlain started paying more attention to their heritage, but they seem more interested in making quick bucks with their silly mainstream launches. Which might, I’m afraid, work against the image and longevity of a luxury brand, but what do I know? The bottle I got, sorry for the typo. Beautiful, post, Kevin. I always love your use of botanical illustrations. You DESERVE to find great vintage perfumes as karmic reimbursement for some of the execrable modern perfumes you have to waste skin time on for review purposes. It’s always sad to think of all the lost perfume treasures, so I’ll note that a peachy and vintagy perfume I particularly like is DSH Mata Hari, which was developed for the Outlaw Perfume Project. Vague Souvenir sounds like a great candidate for Thierry Wasser’s project of recreating vintage Guerlain perfumes. FYI, the Monsier Guerlain blog, where I read about the vintage Guerlain project, opens these days with a wonderful “Man in Red” (Habit Rouge) Super Man – don’t miss it!